Jan Mouritsen, Per Nikolaj D. Bukh et al. Intellectual Capital Statements - The new Guideline. 2002. Ministeriet for Videnskab, Teknologi og Udvikling. In February 2003 The Danish Ministry of Science, Technology and Innovation issued the two new publications Intellectual Capital Statements - The New Guideline and Analysing Intellectual Capital Statements. Intellectual Capital Statements - The New Guideline is addressed to those, who whish to know more about intellectual capital statements and to those who whish preparing intellectual capital statements. The guideline shows how to prepare intellectual capital statements - from strategy to action - and how to communicate the results in the external intellectual capital statement. 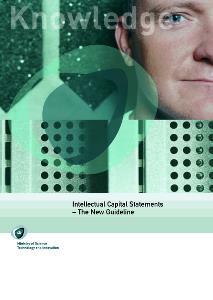 'Intellectual Capital Statements - The New Guideline' is built on a very solid basis. The first guideline was published in November 2000, and since about 100 very different private companies and public organisations have tested the guideline in co-operation with a number of organisations etc. A research team has followed, brought together and processed these companies' experiences.